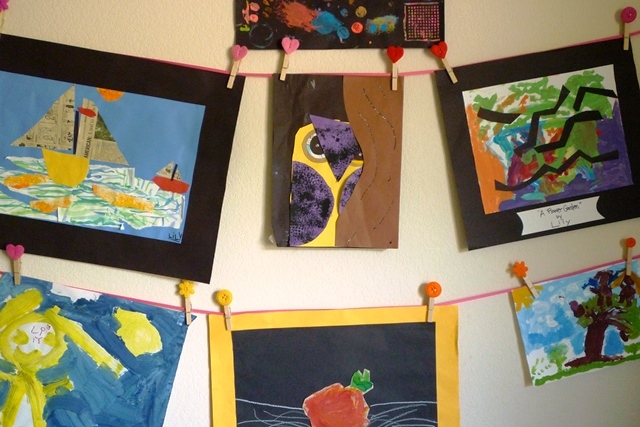 A few weeks ago I posted about the children’s art wall I made (for a small wall near our kitchen) from natural materials: jute string and wooden clothespins. 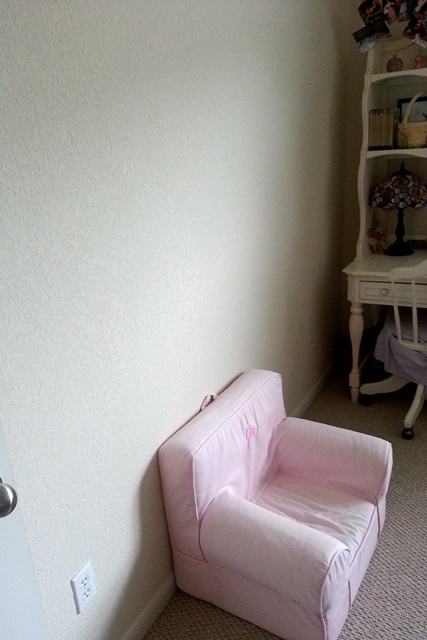 My daughter (with only a little convincing from me) decided that this was a genius idea for her room, too. Same general idea—except this time we’d aim for a bit more color and cheer for her warm and festive (eventually, when it looks in real life like it does in my mind) room. We set off for the craft store for inspiration. I was hoping to find some cute clips, pick out some ribbon, and just be done with it, but alas, no cute clips. We did find some super cute felt buttons though (I can’t say no to red, orange, yellow, and pink). So, not knowing exactly what I was going to do, we grabbed a pink grosgrain ribbon and our new felt buttons, and home we went. I tried to avoid using the glue gun, I really did, because for some reason that thing has always terrified me—buried deep in my craft trunk, ominous and unused, threatening to wound me or forever bind me to something—but after several unsuccessful attempts to affix the felt to the wooden clothespins, my daughter sagely told me that her first grade teacher always turns to her glue gun in situations like this. Sighing, I figured I’d better face my fear. Not a problem! So easy! I have no idea why I’ve been intimidated for so long. 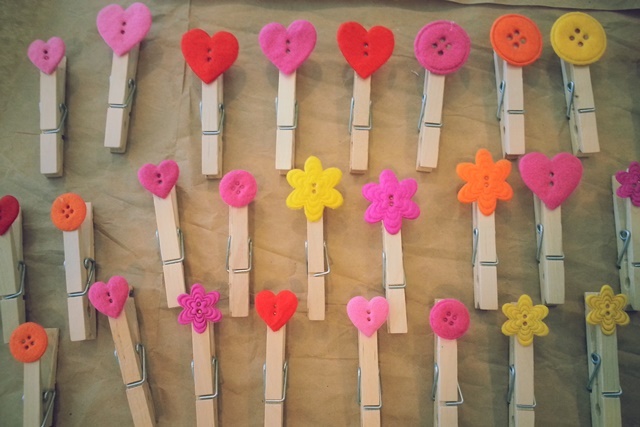 One glob of the hot glue was enough to hold the felt buttons onto the clothespins. Since it was a bit messy though, with little wisps of glue trailing off of everything, I propped the glue gun on a paper plate and laid the clothespins out on a piece of paper to dry—it made for easy clean up at the end. 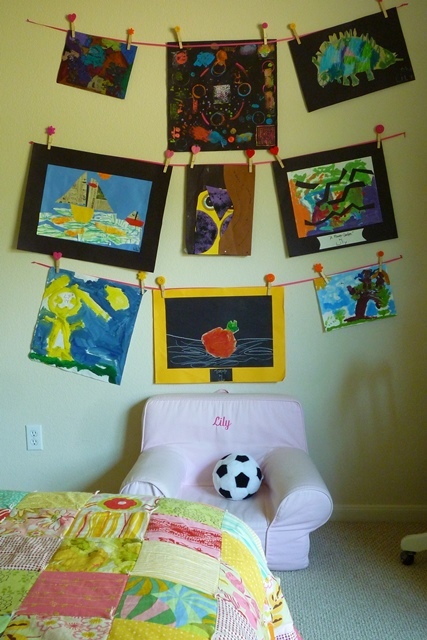 After that I followed the same process I did with the first art wall to place the nails and tie up the ribbons. (Read the steps here.) The only difference was that our upstairs ceilings are only 8 feet high, so I placed the nails at 45, 65, and 85 inches from the floor. good-bye blank wall, hello cuteness! So there it is! My daughter is happy that all her favorite art is up for her to look at every day, and I’m happy to find a $5 solution to a big blank wall. Happiness all around!